August | 2018 | Enough of this Tomfoolery! In 1870, Richard Wallace (1818-1890) received a windfall from his employer the 4th Marquess of Hertford which comprised an art collection consisting of Old Master paintings, 17th and 18th century furniture, snuff boxes and perhaps the second largest assembly of Sevres porcelain in Britain (all in addition to homes in Britain and France as well as land in Britain). Ostensibly the inheritance was a reward for the services Wallace had performed for the 4th Marquess as his private secretary and art advisor, but the long standing belief was that Wallace was the illegitimate son of the 4th Marquess by a mistress, Agnes Wallace Jackson. Since the 4th Marquess of Hertford never married and had no legitimate children, the title and the estate passed to a nephew: however as his art collection was his private property, the 4th Marquess decided to bequeath it to Richard Wallace. The inheritance would be the bedrock of the Wallace Collection and it is fitting that the museum has decided to mark the bicentenary of its founder’s birth with an exhibition looking at Wallace’s life and interests through the objects he collected. During his lifetime, Wallace was well known as a philanthropist – known for his work for the poor both in Britain and France as well as being an art collector. His philanthropy and collecting came together as he was a generous lender of objects from his collection to museums and art galleries and he gave money to enable museums to purchase works of art. In 1872 – by then Sir Richard Wallace – he arranged for a loan of his collection to the Bethnal Green Museum (now the V&A Museum of Childhood) with the stipulation that no admission charge would be levied. 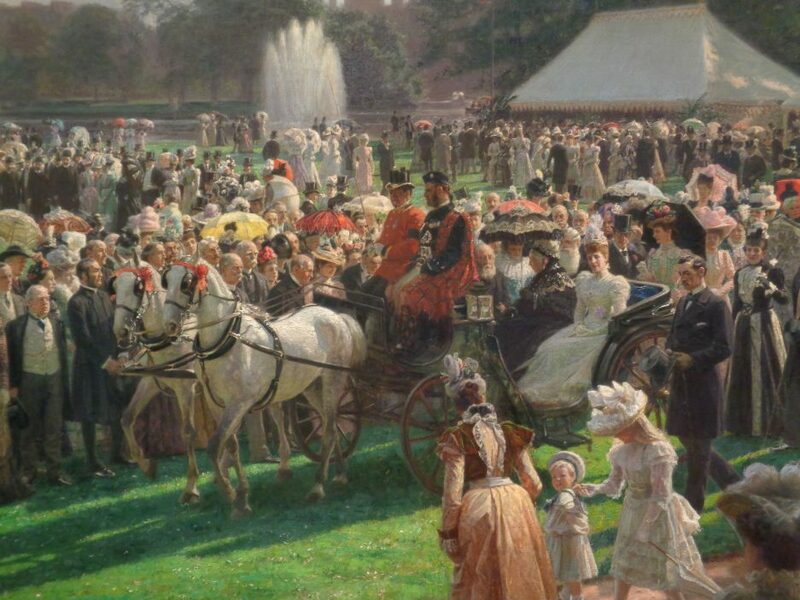 The exhibition ran until 1875 and by the time it had closed some 2.3 million people had visited. On Wallace’s death in 1890 he left everything to his widow Lady Wallace (their only son Edmond having predeceased his parents). In 1897, Lady Wallace died and she left her husband’s art collection, papers and Hertford House to the nation on the condition that admission would be free (much like Wallace’s stipulation to the loan to Bethnal Green Museum). The Wallace Collection finally opened to the public in 1900 and since then has become well known for its stupendous collection of Dutch and British paintings, French porcelain and furniture, arms and armour. To celebrate the bicentenary of its founder, the Wallace Collection has put up an exhibition simply entitled Sir Richard Wallace: The Collector. Featuring archival material from the collection’s files that charts key events in Wallace’s life; such as the codicil in the 4th Marquess’s will where he bequeaths his private property to Wallace, receipts that showed how much Wallace was prepared to spend to add to his collection and a catalogue for the Bethnal Green Museum exhibition. The main highlights of the exhibition of course are the featured objects that demonstrate what kind of a collector Richard Wallace was and his main interests. Unlike the 4th Marquess who collected Old Master paintings and 18th century French porcelain, Wallace’s tastes ran more to Medieval and Renaissance decorative art, arms and armour and non-Western art. He was also particularly drawn to objects that had an interesting provenance or story behind them. What stood out in the exhibition for me were objects that had royal provenance: such as a dagger than belonged to King Henry IV of France which was presented to him as a wedding gift (and later carried by the Emperor Napoleon as a talisman), and a pair of jewelled cups that were made for the Qianlong Emperor for the annual New Year rites. I can imagine that what attracted Wallace to acquire both was not only the craftsmanship and attention to detail that was very evident but also the fact that both were owned by monarchs and had an interesting story behind them. The story behind an object would have most likely been a motivation for the acquisition of the Horn of St Hubert, which as tradition dictated was used by the saint while out hunting when he encountered the stag with the cross between its antlers. For many, many years it was displayed at Chauvirey-le-Châtel until the 1870s, when it was sold to Richard Wallace who paid 16,000 francs for it. As knowledgeable as Richard Wallace was about art and although he took great care with his purchases, he was not immune to purchasing fakes and reconstituted pieces. Some of the Renaissance jewellery that he acquired were not made in the 16th century as advertised but were very clever 19th century copies or outright forgeries, but such was the craftsmanship that they quickly became works of art in their own right. Another example was a silver gilt basin that was made in Portugal in the 16th century but someone later added the coat of arms of Pope Pius IV (1499-1565) in order to increase its value and fabricate an important provenance on a well-made but obscure piece. The exhibition is small but perfectly formed and does shine a spotlight on Richard Wallace which enables the visitor to get to know more about the man behind the collector and philanthropist. Despite the fact that his collecting slowed down in the 1880s due to being affected by the agricultural depression, Wallace remained committed to ensuring that his collection was accessible to the general public and this was finally realised in 1897 when Hertford House and its contents were given to the nation, an act of generosity which was described by a fellow collector and rival, Ferdinand de Rothschild as a “windfall…..[whose] artistic value is inestimable” and to this day it remains a jewel among Britain’s museums.